The Eden Theological Seminary was established in 1850 by German pastors who were serving the American frontier. Many of the early pastors were from the pietistic Basel Evangelical Mission Society which also provided trained pastors, such as Rev. Wilhelm Stärkel, to the Volga German churches in Russia. 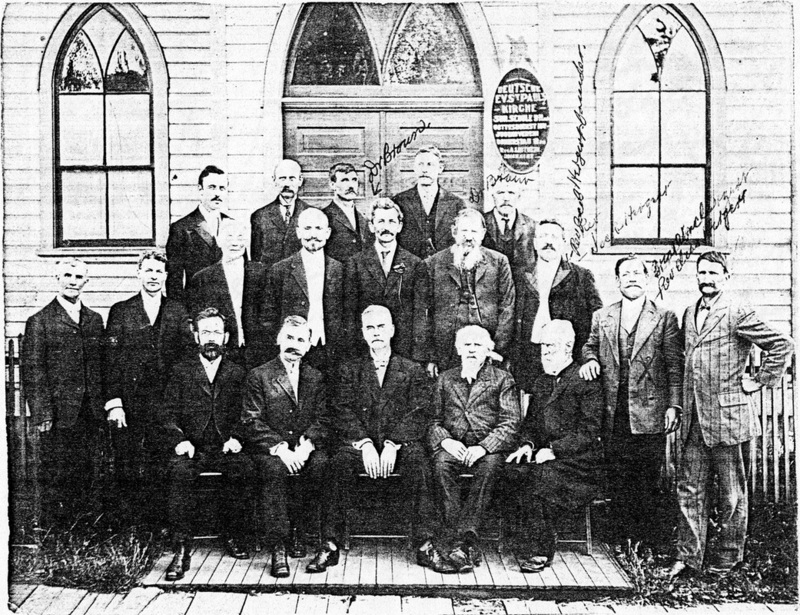 These pastors soon formed the German Evangelical Synod of North America and all theological courses were taught in German through the early 1900s. The German Evangelical Synod served primarily German Protestant congregations of mixed Lutheran and Reformed heritage. Although the ethos of the Synod was largely pietistic Lutheran, it was not a Lutheran denomination. Despite this fact, it was not unusual for congregations to use the word "Lutheran" in their name. The boundaries of the Evangelical Synod were quite fluid in a sense. As an example, Rev. Jacob Hergert served Congregational churches which were similar in doctrine and practice to Evangelical Synod. The Synod did not object to pastors serving these closely aligned congregations. The Eden Theological Seminary published the German language newspaper Friedensbote (the Messenger of Peace) which was widely read by many Volga Germans. The Evangelical Synod established the first churches in Oregon at Eugene and Pleasant Hill by 1891, but the work was discontinued in 1896. Under the energetic leadership of Home Mission Secretary F. H. Freund, at least four German Evangelical Synod churches were founded in Oregon from 1904 to 1911: The St. Pauls Evangelical Church in Portland (1904) served by Rev. Jacob Hergert, the Zion Church in Gresham, Oregon (1906) served by F. H. Freund, the Friedens (Peace) German Evangelical Church in Sellwood (1911) served by Rev. Elias Hergert and the St. Johns Church established at Lents Station (circa 1911). Given the small number of congregations in Oregon, its churches were included in the Washington Mission District which was founded in 1909 in Seattle. The Washington District became the Pacific Northwest District in 1929/30. First District Conference of the Washington Mission District of the Evangelical Synod. Organized at St. Paul's Evangelical Church, Seattle, Washington, June 26, 1909. Revs. Elias and Jacob Hergert are shown second and third from the right in the second row. Dr. John Jacob Braun stands in the center of the second row. Source: E. Horstman. "The Evangelical Synod Answers the Call of the West." The Outlook of Missions 31.3 (1939): 69. Print. The Evangelical Synod merged with the Reformed Church in 1934 and the Pacific Northwest Synod came into being under the new Evangelical and Reformed Church. At this time, there were 14 ministers and nine congregations in Portland serving 917 members. Oregon churches were transferred to the Pacific Northwest Synod in 1939, the Oregon Conference in 1963 and the Central Pacific Conference in 1974. Dunn, David. A History of the Evangelical and Reformed Church. Philadelphia: Christian Education, 1961. 341. Print. E. Horstman. "The Evangelical Synod Answers the Call of the West." The Outlook of Missions. 31.3 (1939): 67-70. Print. Kamphausen, Hugo. The Story of the Religious Life in the Evangelical Synod of North America. Trans. John W. Flucke. St. Louis, MO: Eden Publishing House, 1990. Print.